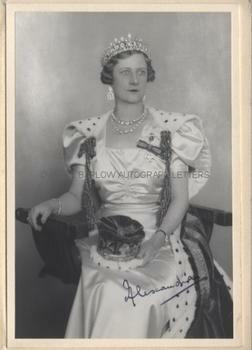 PRINCESS ALEXANDRA, DUCHESS OF FIFE PHOTOGRAPH SIGNED. Consort of Prince ARTHUR OF CONNAUGHT. Daughter of Princess Louise of Wales and the 1st Duke of Fife. A fine, formal photograph, SIGNED on the image by Princess Alexandra. The photograph shows her three-quarter-length, seated. She is in robes of state with satin gown, ermine trimmed velvet cloak and a diamond tiara on her head. On her lap is a ducal coronet (she was a Duchess in her own right). The photograph is mounted on card with japanese paper guard, which is itself mounted inside a Christmas card. The inner leaf of the card is inscribed by Alexandra "To Aitcheson, with best wishes for Xmas & 1938." The photograph measures approx 6.25 x 4 inches and the card is slightly larger. It is in fine condition. After her marriage to Prince Arthur of Connaught Alexandra was known as H.R.H. Princess Arthur of Connaught, Duchess of Fife. She was, however, entitled to the honorific of H.R.H. in her own right. In her youth she had been shipwrecked off the coast of Morocco with her father. When he died of pleurisy, contracted as a result of the shipwreck, she inherited the Dukedom of Fife. She carried out Royal engagements for her uncle, George V and also for her cousin, George VI.